The Seawolves clobbered the Silverswords of Chaminade University, 9-0, on Feb. 18. Sonoma rises to 3-3 overall. In singles play, Chaminade claimed only 3 matches against the Seawolves. Jennifer Kingsley, Jenna DeTurk, Karlee Budge, and Hillary Fazekas all swept their opponents 6-0, 6-0. Sonoma State chalked up its second win of the season, topping University of Hawaii Hilo, 9-0. No. 22 Sonoma State swept almost all matches. Only Amanda Zuidema had to defeat her opponent in a tie-breaker set, 6-2, 2-6, 10-8. Sonoma State fell to BYU Hawaii on Feb. 17, 3-6. 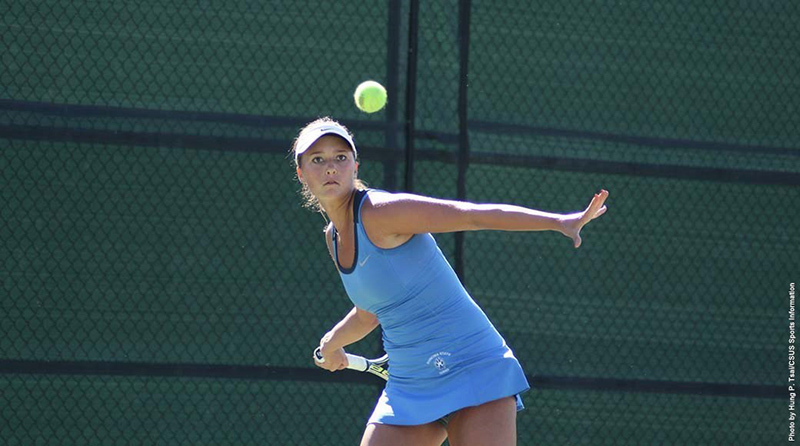 Sonoma State took two of three doubles matches. Hillary Fazekas and Katherine Long won their match 8-4 and Amanda Zuidema and Jenna DeTurk won 8-3. The only Seawolf to come out on top in singles play was Karlee Budge who swept her opponent 6-0, 6-2. The Seawolves stomped the Toros on Feb. 18 in the Wolves' Den 65-50. Sonoma State had four players score in double digits and lead for almost the entire game. With the win Sonoma becomes 8-10 in conference and 12-12 overall. Carly Gill (13), Jessica Mitz (10), Madison Burroughs (17), and Molly Donovan (10) all scored in the double digits for Sonoma. Cal State LA defeated Sonoma State 58-49 on Feb. 17 in the Wolves' Den. Carly Gill had a game high 16 points and Madison Burroughs scored 10. Jimmy Golden scored a game-high 19 points on Senior Night, but it was not enough, as the Seawolves' seven-game win streak was snapped against the Toros of Cal State Dominguez Hills on Feb. 18 in a 58-55 home loss. In front of another packed crowd, the Sonoma State men's basketball team sped past visiting Cal State L.A., 79-67, on Feb. 17 at the Wolves' Den. Five SSU players scored in double figures, led by 19 points, eight rebounds and three blocks from Luke Cochran. Ronnie Harris came off the bench to chip in with 17 points and six assists, Jimmy Golden had 15 points (all in the first half), Armani Nicolis dropped in 13 points with five rebounds, and Jackson Gion scored 10. Looking to qualify for the NCAA Division II Men's Basketball Championship Tournament for the first time since 2006, the Sonoma State men's basketball team is ranked No. 6 in the Feb. 15 release of the first official NCAA West Regional poll of the season. In order to secure a berth in the NCAA tournament for the eighth time in program history, the Seawolves will need to be ranked in the top 8 of the final regional poll, which will be unveiled during a live selection show on NCAA.com Sunday, March 5 at 7:30 p.m.
Men's Baseball is off to its best start of 3-0 since the 2013 season after the 2-0 win against Fresno Pacific on Feb. 19. The Seawolves shutout the Sunbirds for their second shutout this season. Pitcher Aldo Severson picked up his second win of the season and improves to 2-0. Cody Bennett picked up a save in the ninth. The Sunbirds were only able to garner three hits against Sonoma's pitching staff. Sonoma State had five runs of seven hits and boasted no errors. Aldo Severson tallied his first win (1-0) and Jackson Berumen earned a save. The Seawolves record improved to 2-0 as they defeated Academy of Art 5-2. For 32 minutes on Feb. 19, the Sonoma State women's water polo team found itself in an epic battle of back-and-forth action, but Fresno Pacific's Amber Penney scored her sixth goal of the day with one second left on the clock to lift the Sunbirds over the Seawolves, 11-10, in SSU's home opener at Dr. G. Edward Rudloff Pool. Sonoma fell to 3-11 this season. In the first game of the day on Feb. 18 against Cal State Bakersfield, Ellen Peterson tied the game up at 2-2 at the 7:15 mark of the second quarter, but the Roadrunners responded with seven unanswered goals to lead 9-2 midway through the third period. The Seawolves outscored CSUB 7-6 the rest of the way, but it wouldn't be enough as SSU fell 15-9. The Seawolves played against host UC Davis to end their tournament for their last game of the day. The Seawolves overcame an early 2-0 deficit to take a 4-3 lead at the end of the first quarter, but the No. 12 Aggies went on a 16-2 run the rest of the way, including eight unanswered goals in the final nine minutes of game action for the 19-6 victory. Justin Shluker and Devin Gregg both fired a 143 total for the two rounds at the Visit Stockton Cactus Thaw Tournament in Stockton on Feb. 13-14 to tie for No. 31 overall and sixth place for SSU. Spencer Clapp had the lowest round with 67 for the Seawolves.